our own inner light and open us to the mysteries and love within and around us. taken place over the last couple of years at this retreat. to ease and clear our emotional suffering. energy will help give us greater wisdom to take our spiritual journey forward. with better physical and emotional health. Yogiraj’s East Coast retreat will be held in the Catskill Mountains this year! the consciousness of self within the vast universe. first or tenth, is unique and life changing. awaken us faster towards our goal of Self-Realization. Every morning I am born anew. There is love in my heart, and wisdom is radiating from my mind. I bow to the in dwelling Spirit residing in all of us. That at the level of consciousness, humanity is one. I am Spirit, I am Truth, I am Love Divine, this Body, Mind a Dream of Mine. The only purpose of man’s sojourn on this Earth is to seek God, all other things are secondary details. This is pure spirituality. If Earth Peace is to happen on Earth, let us realize that Humanity is our uniting Religion, Breath our uniting Prayer, and Consciousness our uniting God. The UNREAL Truth about Anandamayi Ma and Paramahansa Yogananda, the Kriya Yoga Master and founder of Self Realization Fellowship. A lot has been said about Yogananda posthumously – this video addresses some of these things and attempts to give the Himalayan Kriya Yoga master’s perspective on them. Yogiraj Gurunath Siddhanath has also had personal experiences with Anandamayi Ma, the bliss permeated mother, which he describes here, in the context of the Avadhoot Avatar Doctrine. This doctrine of knowledge attempts to put things in their proper place in terms of spiritual hierarchy. Reigning over the hierarchy of the heavenly host is the divine visible-invisible savior called Mahavatar Babaji, who is the Mahayogi and Mahaguru and supreme Yogiraj, called the Nameless One, and yet goes by many names, including the Non-Being Essentiality, The Is-ness of the Zero-Not-Zero, The Eternal Now, Shiv-Goraksha-Babaji, Gorakshanath, Gorakhnath, The Lightning Standing Still, the Lakulish of the Lilac Lagoon, the Lightless Light which Lights That Light which Lights the Light of All Our Souls, and so on and so forth. Himalayan Yogi Yogiraj Gurunath Siddhanath brings a unique message of peace to audiences across the world through kriya yoga and a new world tour. For generations, many have sought to bring world peace to the planet. While peace has been cultivated in certain geographic regions, a global peace remains elusive. The concept of world peace seems to have become cliché. Renowned teacher, author, and spiritual leader Yogiraj Gurunath Siddhanath, however, believes world peace is possible. Yogiraj thinks that it’s simply not pursued in an effective way. Yogiraj Gurunath Siddhanath has a unique view of world peace and he’s sharing this as a practice with audiences across the world, through his books and this international tour. The Tour stops in over twelve cities along with three spectacular retreats. The first retreat is along the Pacific Ocean in Carlsbad, the second at the base of Mt Shasta, and the third retreat is in the Catskill Mountains, New York. More information is available on the Siddhanath.org website. Yogiraj Gurunath Siddhanath taught the concept of world peace for more than five decades. In fact, peace is the topic on which he established his foundation as a teacher. At the core, his message is and has been one of “Earth peace through Self peace”. An idea that, by yogic breathing, meditation and self-reconciliation, a broader, global sense of camaraderie can be developed, what Yogiraj Gurunath Siddhanath calls world peace yoga. Yogiraj Gurunath Siddhanath has brought this unique doctrine to audiences across the planet. 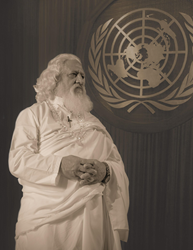 Yogiraj has taught this message of peace at the esteemed United Nations, and at the same time amassed millions of views on his popular YouTube channel. Recently, the master’s views on Earth peace have been compiled and shared in a book, called Babaji: The Lightning Standing Still. The book is, nominally, a newly revealed study of the ancient figure called Babaji, the progenitor of Yoga. The book includes insights into the ancient practice of kriya yoga given by Babaji, plus, Yogiraj Gurunath Siddhanath’s instructions on how Earth peace, through inner peace is manifested. It is a far-reaching work that Yogiraj Gurunath Siddhanath describes as the culmination of his life’s work. Yogiraj Gurunath Siddhanath is sharing the book with world audiences throughout the summer. The world tour begins in Pune, India, moves from Asia to Europe and then to the United States in July, August and September. The US visit will span from New York to California. Yogiraj Gurunath Siddhanath’s visit will include multi-day teaching events and yoga retreats. At all of the tour stops, the author and teacher will expound upon the doctrine of “Earth peace through Self peace.” Yogiraj Gurunath Siddhanath says that while in the West, Yoga is often viewed as physical postures. In India, Yoga has long been the gateway to profound, inner peace. In his own words, “The alpha and omega of yoga is self realization” – in essence, the most lasting inner peace humanly possible..
For details about Yogiraj Gurunath Siddhanath’s tour and where to see him in-person, visit his website:http://www.siddhanath.org. The website also offers books, poetry and videos as well as in-depth information about his life’s mission. SHIVAPAT– Sharing his Enlightened Consciousness of thoughtless awareness resulting in Spiritual Evolution which brings about a Unified Field of Consciousness amongst the people. SHAKTIPAT – Transmitting center to center in the disciple’s Chakras the Kundalini Energy which burns their negative karmas. PRANAPAT – Breathing His spiritual Prana (life force) through the breath of the disciples in their spinal cord flushing out all toxins & emotional stress. HAMSA – The Hamsa means the Swan and symbolizes the Soul. In meditation, Yogiraj has seen the Hamsa Swan symbolized in the lateral ventricles of his brain. These superconscious states of a Yogi are clearly documented in his film “Wings to Freedom”. He bestows these states on deserving disciples who have practiced Kriya Yoga assiduously. BABAJI’S MYSTERY UNVEILED – Yogiraj reveals that Shiva Goraksha, the Supreme Master of Yoga, and the Babaji mentioned in Yogananda’s Autobiography are one and the same person. This is clearly researched in his book “Babaji – The Lightning Standing Still”. It is not often that we are given the opportunity to be a part of something that will not only change us, but is also world changing. Combining the powerful energies of the sun and the ocean with Yogiraj’s loving energy is a combination that will help unlock our own inner light and open us to the mysteries and love within and around us. From testimonies of some of those who have attended previous year’s retreats at Carlsbad, it is clear that the energy levels seem to be particularly heightened by the presence of the Pacific Ocean at the doorstep of this venue. Many spiritual and emotional healings have taken place over the last couple of years at this retreat. The oceanfront location in Carlsbad could be the most powerful and emotionally moving event of Yogiraj’s tour this year. We will all be sharing an oceanfront meditation with Yogiraj on the beach. Yogiraj’s healing transmissions during this retreat will be working specifically on the chakras to ease and clear our emotional suffering. In today’s world, with all its social disharmony and anger, the clearing of our chakras and getting them balanced is necessary for not only good mental and emotional health, but also for our spiritual growth. We live in a world where our uncontrolled feelings and emotions can cause us great suffering; so healing them with loving energy will help give us greater wisdom to take our spiritual journey forward. In particular, Yogiraj will be focusing healing energies on the second chakra, which when unbalanced, makes us feel disconnected and emotionally unstable. It can cause us to have heightened fears of change, blocked creativity and expression, as well as making us feel depressed. When this chakra is in balance we will experience sensations of wellness, pleasure, gratitude, and joy along with better physical and emotional health. The elemental nature of the second chakra (Svadhisthana) is water. This special meditation and transmission with Yogiraj, combined with the elemental nature of the vast ocean will focus this powerful healing force on each of us. As personally tailored by Yogiraj, the transmission will prove to be a powerful healing experience for those who come. This is an opportunity to change your life focus and direction – a chance for true healing in the presence of a Master! natural state of Divine Consciousness. Big Bang; a stillness which lies at the core of your own Being. Is samadhi something we’ve experienced and forgotten? sheath of flesh and blood and bone. Consciousness and realize that you are a Soul and you have a body. an appendix, an attachment of “body,” that is just your garment. Yoga” taught in the West? basically and essentially, Yoga is not postures of integration of asanas. Consciousness. The urge is to go back to our Parent Source. reach its natural state of Yoga-union with its Infinite Spirit. realized Samadhi-Yoga, or the True State of Infinite Consciousness. usefulness be dispensed within Himalayan Yoga or any yoga. What then is Kriya Yoga? How does it differ from other systems of Yoga? musical notes and varied instruments. both and linking the spectrum of all. one’s self to the Divine, be it as Guru or God. Samadhi, home, to their Parent Source.